Having all the Google based services integrated right inside the browser, Google Chrome is one of the most used browser. 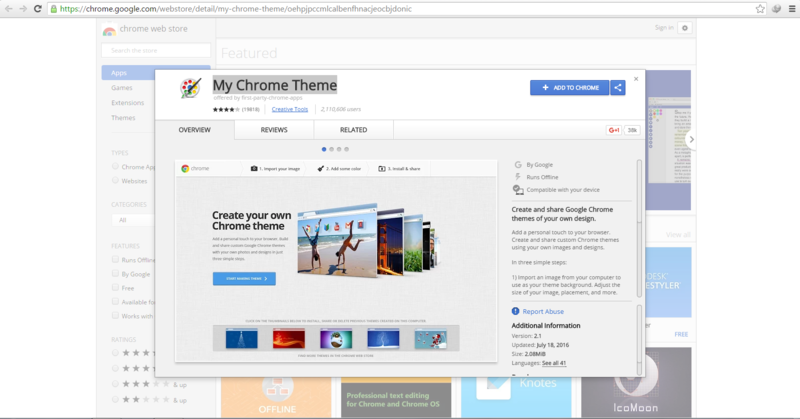 There are many themes for Google Chrome available on the Chrome web store and you can choose to download one of them to customize your browser. However you can also go ahead and create your own Google Chrome theme using a simple easy to use app. Search for My Chrome Theme App in the Chrome web store ( if you can’t find the app then click here to get the app) and add the My Chrome Theme App to your Browser. Wait for the app to start and then open the App. You might see a message that says “My Chrome Theme has been discontinued”. Ignore the message as this app is still working and it can create themes for you with ease. Click on the “Start making theme” button and you will see a new page. You can choose a pre-existing image that you plan on using for the background of the theme or you can get more personal and use your webcam to take a picture. Upload the image which you want to have or take a picture with your webcam. Then you will be able to see three options related to the image background. You can adjust the position of the image, you can choose from different image effects or you can choose to import a totally new image if the current image isn’t good enough. Note: It is suggested that you use an image that is at least 4K in resolution to make the theme look good even on high-resolution screens. Then continue to Step 2 where you have to choose the colours. You can choose the colour of three main things: active tab, background tab and the background of the tab stack. After have made the necessary settings move on to the next step, where you would be asked to name your theme. So name your theme as you wish and click the “Make my Theme!” button. Then click on “Install my them” and the theme will be installed after it is downloaded.